Now that we’ve been introduced to the problem and learned about the respective roles of sedation, early mobility, and delirium, how do you start to apply these concepts in your own unit? Here are a few ideas. None of this is particularly radical or novel. In fact, while our understanding in these areas continues to grow, the basic principles are now decades old, and there is a general acceptance of the overarching goals. 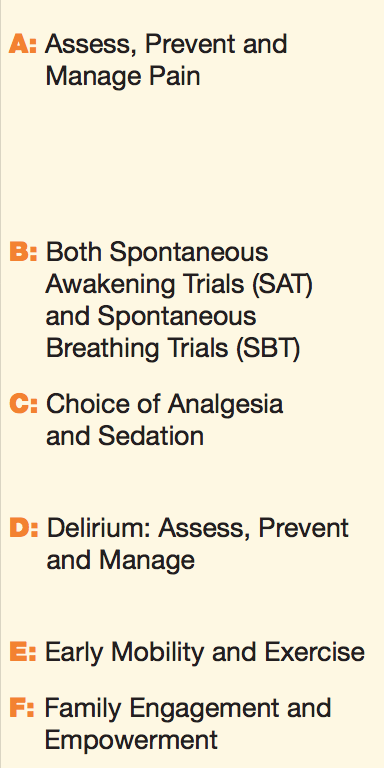 The Society of Critical Care Medicine (SCCM) has been promoting these practices for years as their “ABCDEF” bundle, which closely mirrors what we’ve discussed. They’ve supported this with a website on ICU liberation, published formal guidelines on the management of Pain, Agitation, and Delirium, and host regular seminars teaching the nuts and bolts. The fact is, this isn’t a new drug, novel device, or untried therapy. It’s simply a package of routine best practices. There’s little standing for anyone to argue that patients should not be awake, moving, non-delirious, et cetera. In reality, however, many of us are not doing this well. Even in some illustrious academic centers, you can still tour the ICU and discover numerous unconscious, immobile, delirious patients. Why? It’s not glamorous. Rolling out an ECMO program or introducing a new drug is exciting and people want to try it out. There’s nothing exciting about making simple, rudimentary changes to your best practices. Culture inertia. Paradoxically, it can be fairly easy to convince people to change one big thing (introducing a new ventilator, eliminating a drug), but difficult to ask them to change the small practices that make up their daily routine. If they expect to find their vented patients sitting in a chair watching TV, they can make that happen, but that’s not what they’re accustomed to — they expect to find them unresponsive in bed, so that’s what they make happen. Everyone’s daily workflow and processes have evolved to support the current practice milieu, and convincing everyone to change each of those little pieces requires steady, active effort, not a single memo or class. Dysfunctional motivations. A dirty secret is that many of these changes have the perception of increasing workload, particularly for nursing staff. Unconscious, immobile patients are easy to take care of. When they’re awake, they ask for things, and mobility activities can require additional labor. Even more sinister, if you make patients better faster, they’ll leave the unit sooner, and a new admission will take their place, all of which means even more work. While it may not represent good care, a comatose patient who stays in the ICU for weeks is a very easy patient to manage. Some of this is a misperception — conscious patients can assist in their own care and non-delirious patients may require less supervision — but some of it is undeniably true. How should you address these issues? Since none of these practices are particularly novel, the challenges to implementation don’t lie in innovation — they’re in the details. It’s about logistics and practicalities, not about theory. For instance, it’s easy to say that nurses should titrate sedation until patients are calm and awake. But many units are already saying this, and ordering it, and everyone’s trained to do it, and in reality, it’s not happening. The patients are still comatose. Then what? Clearly, some combination of training, oversight, and changes in both culture (to make people want to change) and the practice environment (to make it hard to do the wrong thing and easy to do the right thing) are needed. You must have nurse-assessed scales for both pain (e.g. CPOT) and sedation (e.g. RASS). This allows you to specify that drugs should be titrated to specific targets, and not administered according to whimsy. For routine purposes, the sedation target should be awake, calm, and with pain controlled, the equivalent of a RASS of 0 to -1 with a pain score of 3 or less. Analgesia before sedation. Only after pain is treated should sedative drugs be added. Multi-modal analgesia. Benign non-opioid agents should be used when appropriate to limit opioid requirements. Intermittent boluses before infusions. Only after failing analgesia by intermittent pushes (e.g. fentanyl or hydromorphone) should a continuous drip be started, and likewise intermittent sedation (e.g. haloperidol — preferably not benzos) should be tried before drips (e.g. propofol). This simple change can dramatically reduce overall drug delivery. However, you also need a process for getting off a drip once it’s been initiated, which at a minimum should include daily sedation interruptions. Avoidance of benzodiazepines whenever possible, except in alcohol withdrawal, seizure, and other special cases. Thoughtful use of dexmedetomidine. It is not yet obvious how to incorporate Precedex — should it be used after failure of intermittent boluses, or is it preferable to them? It’s a continuous drip, after all. It’s also still fairly expensive, although its potential benefits may be significant. A widely accepted approach to this has not yet evolved. Finally, an ongoing process of training and auditing of compliance by both providers and nursing is needed to slowly and steadily steer practice onto the new heading. The PT/OT model. This is the simplest to implement, and essentially just means ordering PT and/or OT consultations early on all admissions. However, logistics still need to be tackled, because those departments will generally need to hire additional staff, and often introduce new training and protocols for mobilizing high-acuity patients. The dedicated mobility team. This involves a team, usually headed by skilled therapists, that is dedicated to your unit (not shared) and has the sole mission of ICU mobility. Again, this requires the budget to hire new staff. The nurse-driven model. This is the model used by Schaller, Hester, Titsworth, and others. Upon admission, ICU patients automatically enter a protocol whereby the bedside nurse mobilizes them each day in accordance with clear inclusion/exclusion criteria. Nearly all patients will be eligible to use the protocol, although they will achieve different levels of mobility according to their ability and stability. Training and some basic equipment is needed, not all of which is routinely available in many ICUs (wheelchairs, walkers, etc), but the largest challenge is culture change. Once nurses are used to moving their patients, it’s no longer strange. Whatever your model, it should include certain features. If at all possible, it should be automatic: all patients should be involved unless specifically “opted out” by a provider order. An “opt in” process that must be ordered according to provider discretion will result in poor participation. It also must permit truly early mobilization (within 1–2 days from admission), which means it must allow mobility of intubated patients. Regardless of your model, skilled therapy staff should be involved in your planning, including PT, OT, and physiatry. Even if they aren’t doing the bulk of mobilization, they will still serve as consultants in difficult cases, and they will have invaluable input on your protocols and processes. This is what they do, after all. Depending on patient population and budget, specialized equipment can play a role, such as Hoyer lifts, beds that transition into tilt-tables (allowing completely immobile patients to obtain an upright weightbearing posture), in-bed cycle ergometers, and more. All patients should be screened for delirium using a score such as the CAM-ICU. This can be done as infrequently as once a day or as often as q4 hours. Since delirium waxes and wanes, once per shift is probably a good minimum. The results should be documented and reported to the treating team (when information isn’t used, people eventually stop acquiring it). It should probably also be tracked as a unit-level quality metric. Basic sleep interventions should be implemented routinely, either as a default unit protocol, or as a simple pre-built orderset. Visiting hours should be liberalized or eliminated, and family can be involved in patient care where appropriate — assisting with repositioning, mobility, etc. One caveat is that in some cases, the increased presence of family can be a challenge for both nursing and for family members themselves (if they perceive an obligation to be at the bedside whenever not forbidden). Department-level discussions should be undertaken with occupational therapy and speech language pathology to best determine the role they can play for cognitive therapies and facilitation of communication. Okay, okay — but how do you make it work? The Hassan project may be the most informative here. Initially, the focus in campaigns like this is training: we assume that people merely need to know how to do things differently. And they do. But the knowledge gap frequently isn’t all that large. There are plenty of things we all “know” how to do and even “know” we should be doing, but still don’t do. There can be many reasons, but usually boil down to something like this: other people aren’t doing it; it takes work to do; and we’re not convinced it matters. Auditing and surveillance. Particularly in the initial onboarding stage, each new intervention will need supervision to ensure people are actually doing it, and doing it properly. If not, gentle retraining is indicated. Nothing punitive early on — just oversight. Once practice has shifted, monitoring can step down to a lower level to monitor compliance. Advertising. Get the message out. Fill your unit with positive reinforcement: signs by patient rooms, posters describing what you’re trying to do, point-of-care reminders on computers and workstations. Schedule classes, lectures, grand rounds, journal clubs, anything you can to spread the message. Discuss it on rounds and during teaching. As you achieve milestones, publicize them — snap photos (with permission) of patients up in chairs, ambulating the halls, awake and waving on the vent, and post them for everyone to see. Highlight the most successful providers and nurses and trumpet their work individually as well. Engage at every level. This being an exercise that lives or dies by implementation, it cannot be conceived wholly at the top and force-fed onto the rank and file. Leadership and administration should be engaged. But just as importantly, clinical staff should be involved early to provide input on practical issues and obstacles, which should not be glossed over, but addressed early. Providers with objections to your protocol should either be swayed or their concerns incorporated; otherwise they’ll remain a pebble in your process forever. Experienced nurses who tell you something won’t work should be heeded, and with everyone at the table, an alternative devised that makes sense to all parties. Think about workflow and workload from the beginning. Everyone’s day is already full, and regardless of engagement, nobody will ever care as much about your project as you. To change practice, it must be easy to change, hard not to, and it shouldn’t contribute to anyone’s problems. (An example: perhaps you will encourage discontinuation of sedative drips by making the orders expire every day, requiring manual renewal. A good idea? Well, it means more work to place those orders. Whether that’s worthwhile will require weighing of the pros and cons.) If you ask people to document something new, see if there’s another field that’s become redundant and can be eliminated. If you ask them to undertake a new activity, consider when they’ll do it, how they’ll do it, and whether your scheme is plausible. If not, figure out how to make it so. Bridge the gap from theory to practice isn’t an extra step, it’s the whole exercise. Monitor, track, and publish. Nothing’s a success unless you can prove it. Gather data to demonstrate the success — or failure — of your efforts, both at the outcome level (ICU length of stay, vent times, etc) as well as measures of pure efficacy (sedative burden, level of mobility achieved, delirium rates, etc). Report it to your staff as well as to your bosses — consider publishing it or presenting at conferences, or even giving it to your PR people to spread the word in the lay press. You’ve done the work, now brag about it! Keep it up. In the end, many projects that succeed in the short term fail to create long-lasting change that outlives their initial champions. On the one hand, true culture change must be achieved; if your changes require constant intervention to maintain, they’ll disappear once attention turns elsewhere. On the other hand, oversight and monitoring should continue, because even the best intentions and truest changes can wander and become forgotten when enough time has passed. With both of these thing, however, you should be able to return in a decade and see the measures you introduced still going strong. We’ve been through a lot in this series, from the evidence behind sedation to the details of ICU delirium. In the end, though, the most important thing may simply be this: your mindset needs to change. Rather than being excited about the initial resuscitation of a critically ill patient yet losing interest once they’re stabilized , both stages should engage your interest equally. Resuscitate and deescalate with equal vigor and zeal. By good resuscitation, you can prevent death; by good deescalation, you can “bend the curve” of the slow tail of recovery, dramatically reducing morbidity and mortality in the post-acute phase. With every patient who is no longer acutely unstable, you should actively be seeking to wake them up, mobilize them, remove lines and tubes, discontinue meds, extubate, and get them out of the ICU. Get them up. Involve their family in their care. Avoid the sedative-delirium loop; if patients are delirious, seek to reorient them, normalize them, and remove (rather than add) sedatives if possible. Above all, try to think of patients as human beings who should return to doing human things, rather than specimens to be subjected to further medicalization. While I can’t offer any evidence for the last assertion, I cannot help but agree. This series is adapted from a Grand Rounds lecture given at the University of Maryland Prince George’s Hospital. My gratitude to the teachings of the Johns Hopkins Hospital critical care and rehabilitation teams, which have heavily influenced this material. Particular thanks to Dr. Dale Needham and the excellent material from their annual Critical Care Rehabilitation Conference.